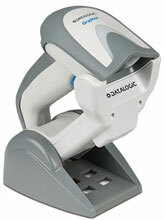 Datalogic Gryphon I GBT4400 - Scanner only, high-density, Bluetooth. Color: White. Scanner Only - Cables and accessories must be purchased separately. These include USB (Part# 90A052100), PS/2 (Part# 90A051360), or RS-232 Serial cables (Part# 90G001070), Power supply (Part# 6003-0941) and either Charging/Communications (Part# BC4030-BK-Bluetooth), AC Line Cord (Part# 8-0935), or Charging-only cradles (Part# CHR-GM40-BK). The Datalogic GBT4400-WH-HD is also known as Data Logic	DTL-GBT4400-WH-HD	or GBT4400WHHD	.